This OddsMonkey review takes an in-depth look a look at one of the innovators in matched betting whose odds matching software powered many of the early matched betting websites. Oddsmonkey.com was started by Paul King in August 2011 and was very much a part-time project for over four years focusing on supplying odds matching software to other matched betting companies. Paul recounts the story of why and how he started the business in an interview here. The Oddsmatcher was made available to the public for a modest monthly fee and as many as 70 websites used the web-based software for their own subscription services. OddsMonkey.com was later revamped to a fully-fledged subscription service after teaming up with Growth Capital Ventures in March 2016 and now provide support, training, guides, daily offers and an impressive array of matched betting tools. Oddsmonkey operates within the Dotnetpages Ltd company which is still majority owned by Paul King and his family with Endeavour (145) Ltd now owning approx 41% of the Company. Newcomers dip their toes into matched betting with OddsMonkey.com by taking up a free trial which should typically make around £45 profit. It should be enough to convince the most sceptical that matched betting does generate profits from free bets. The trial offers are with Coral and Betfair and anyone already holding accounts with these mainstream bookmakers will need a Premium account to access more sign up offers. Full access to OddsMonkey Premium is available for £17.99 per month or £150 for an annual subscription, giving a yearly saving of over £65. The trial could pay for the first three months membership and if you find matched betting is not for you, you’re covered by a 30-day money back guarantee. OddsMonkey.com is so confident you’ll want to continue matched betting, it’ll provide a refund for any reason on condition requests are emailed before the end of the 30th day of Premium membership. The OddsMonkey home page is a neatly laid out advertisement for matched betting and the earning potential from using its services. A large customer testimonial shouts how much can be earned and there are links to more stories from happy customers. A useful 3-minute video explains how bookmakers free bets are used to make money risk free followed by a brief outline of the service and its three major selling points; the odds matching software, offer guides and daily offers calendar. The navigation menu has links to free guides which on closer inspection are teasers encouraging the visitor to sign up for the free trial and don’t provide much helpful information. Other links provide summary explanations of the site’s matched betting tools such as Oddsmatcher, Daily Offer Calendar, Calculator, Racing Matcher, Eachway matcher, Acca Matcher, Dutch Calculator and Community, the increasingly popular forum for Premium members. To discover the nuts and bolts of OddsMonkey, you’ll need to register for the trial or sign up for OddsMonkey Premium. Odds Monkey have made a number of improvements to the user journey and the home page for Premium members is the Dashboard providing account details, current progress through training and quick links to the important sections of the site. If you’ve done the trial, you’ll have already covered the introductory tutorials and two offers in the Start Here section. While it’s not obvious where to go next, it’s not too difficult to figure out how to use the Training tab to find the various offers which are categorised into new account offers, existing customer offers, casino & games and bingo. Here you find a list of offers, each with its own step-by-step guide. Other categories under the Training tab cover product guides, explaining how to use the various tools and there are over 20 articles with advanced tips and guides covering matched betting strategies and troubleshooting. The guides are concisely written, making them easy to follow once you have faith in the matched betting process. New account offers are listed by how easy they are to complete and most of the easy offers have a video tutorial which will be very useful for matched betting novices but many of the offers rated ‘average’ and ‘hard’ are lacking video guides. There are links to each guide and members can make the offers complete to hide them from the list. A ‘Completed Guides’ tab will reveal all that have been marked should you need to visit the offer guide at a later date. There is a search field which is deployed on the various offer sections of the site which finds returns all tutorials and guides within the section that contain the search term anywhere in the text. OddsMonkey has collated most of the new customers offers available to UK and Irish residents, but I noticed three fairly new bookmakers were missing including an easy to claim bonus worth around £70 profit which was disappointing from a purported market leader. There are a few risk-free casino offers but by no means an exhaustive list. However, the casino guide explains what you’ll need to know if you come across no deposit bonuses elsewhere on the internet. Similarly, the list of bingo offers is modest but with bingo websites appearing and disappearing on a frequent basis, the general guides adequately cover how to make money from them and there are no special tools required. Existing customers (aka reloads) are listed in the Tools tab along with a Daily Offer Calendar which displays offers that are available to do on the day. The Current Offer list ranks offers by profitability. Beginning with those that guarantee a profit followed by advantage play offers ranked by Expected Value -an estimation of the profit over time. These values can only be taken as a guide since much depends on how close a match can be found. There is a sort filter with a number of options which can be useful for tailoring the list to your preferred workflow, for instance, if you want to the most profitable fist or like to work from bookmaker to bookmaker. It’s a well-researched list of offers, bonuses, free spins and prizes but members are forced to dig deeper to find details of some specific offers. For instance, horse racing offers, greyhound offers and acca insurance offers are bundled together in one long article and can’t easily be found individually. This isn’t particularly intuitive for newcomers or useful for quickly identifying the best racing offers of the day. The design is nice and simple and for the most part, the guides are laid out in a way that makes it easy to digest the information. The navigation is not the most intuitive and some offers can be difficult to find, however, it doesn’t take too long to get to know your way around the site. 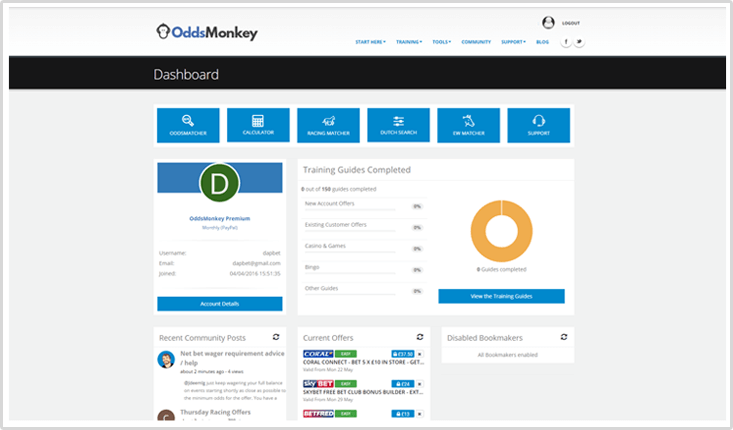 The range of matched betting tools is probably the biggest selling point for OddsMonkey, especially as they are all included with Premium membership, no additional charges. 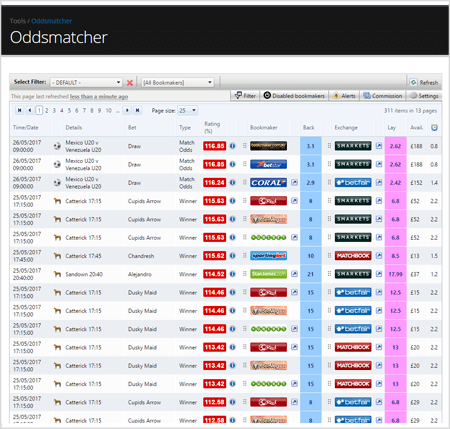 Oddsmatcher is the main tool and the most important for basic matched betting. It provides bets rated by how close the match between bookmaker and betting exchange odds and has loads of configurable options. The range of sports covered by the Oddsmatcher is the best currently available with markets for Basketball, Cricket, Football, Horse Racing, Ice Hockey, Rugby League, Rugby Union and US Football. It has the standard match rating and users can set minimum and maximum values as well as setting their own range of odds to search by, minimum exchange liquidity and relative time, from now up to months ahead in 9 preset stages. You can choose to exclude bookmakers for the search or search by any selected in the filter. Anyone benefiting from discount commission rate can set their personal rate for each exchange. Another nice feature is the ability to set email alerts for specific matches, for instance, a 95% match at odds between 2.0 and 5.0 at Goodwood. This works well in circumstances when the betting markets are fairly stable but is hit and miss the closer it gets to the start of an event due to how quickly the odds can change. The integrated OddsMonkey calculator defaults to a £20 stake and automatically calculates the lay stake for a balanced profit or loss when adjusted to the desired stake. The calculator has options for using a normal qualifying bet, free bet stake not returned. free bet stake returned and risk-free bet. Both the match information and calculator contain links to the bookmaker and exchange websites and in some instances are deep links to the market or bet slip. There are more than 80 bookmakers featured in the Oddsmatcher but unfortunately many cannot accept bets from the UK due to licensing restrictions. Using this OddsMonkey.com tool can be frustrating at times as the bookmaker odds are often unavailable and can take 5 minutes or more to refresh with updated odds. Users must learn to tolerate changing odds, especially on betting exchanges and even the most efficient odds finders can’t be 100% reliable with bookmaker odds. However, there is more reliable odds matching software available but perhaps not with such a wide range of sports markets. Racing Matcher and Tennis Matcher provide matches based on individual offer criteria. It’s a great concept and quick way to look for suitable matches on an offer by offer basis or race by race basis. The bets appear to be linked to the stand-alone calculator so there are no links the respective betting sites and therefore no deep links to markets. Racing Matcher suffers the same issue with outdated odds as the main Oddsmatcher but remains a very useful way to approach horseracing offers. Acca Insurance is a consistent money-spinner for matched bettors and OddsMonkey have created a number of tools to help simplify the process and remove the need to use spreadsheets. Its Acca Builder suite is a disappointing attempt to provide ready-made accumulators with the flexibility to change selections. Configurations can’t be relied upon to meet the offer terms and conditions, there are limited swap selections and regularly fails to find the best value bets. The more recent Acca Finder tool simply churns out every permutation of accumulators it can find with a positive value in a two-week window which at least makes it easier for the user to choose alternatives. On selecting a bet with Acca Finder, there’s the option to change methods, with standard lay sequential, lay all at start, lock-in and to use sequential with a free bet. The acca shows the financial implications of the various outcome and the expected value and qualifying loss for the chosen method. This is a much better implementation and the one I imagine most will opt to use. However, it is still unable to calculate the best value accas available. Each way matcher is an advanced tool for experienced matched bettors which is designed to exploit the difference in place terms between bookmaker and exchange. In theory, there are opportunities to make money from the place odds while avoiding arbing the win odds which would put betting accounts at risk of being restricted. There are risks associated with non-runners and withdrawals and OddsMonkey make it clear which races will be affected if the number of runners is reduced by one. Odds Monkey also has a Dutch search tool which compares bookmakers odds for two and three-way markets. The tool has a number of configurable options which is essential as in default state it returns matches from non-UK licensed bookmakers. The tool can be set to provide alerts and has the potential to save exchange commissions for some qualifying bets. In addition to the web-based tools, Odds Monkey provides a number of spreadsheets which open the opportunity to make money from dutching extra place races, calculating the outcome of ‘money back if’ offers as well as spreadsheets for tracking profit and betting accounts. Towards the end of July 2017, OddsMonkey announced that they would be integrating a function into their software from which members could place their lay bets at Betfair from directly within their OddsMonkey account. Members would no longer have to leave OddsMonkey to place their lay bets, making the process of matched betting quicker and easier. The OddsMonkey/Betfair integration was initially met with mixed reviews from members as many had concerns regarding the security of their details stored in Betfair and the openness of their matched betting practices. In 2016, Betfair & Paddy Power joined forces to form Betfair Paddy Power PLC and members of OddsMonkey were worried that if Betfair were aware they were matched betting, then so to would Paddy Power. However, OddsMonkey told members that they had assurance from Betfair that no details would be shared with Paddy Power and that their two-factor login process meant their account details were secure. Most members seemed to have warmed to this feature and, concerns aside, it is a sign that OddsMonkey are striving to move forward by developing ways to make matched betting easier, less time consuming and more profitable for their members. OddsMonkey mobile optimisation is fine for general navigation of the website, watching video guides and reading text articles. With the exception of the stand-alone calculator, the other tools are difficult to use on smartphone. The Oddsmatcher and integrated calculator require a lot of horizontal scrolling to see important information making it difficult to evaluate the relative merits of the search results. The tools are much better on tablets however which could make useful second screens for matched betting but overall, the site doesn’t make for a good experience for anyone who wants to do a little matched betting on the go. Oddsmonkey provides support seven days a week up until 9pm. Sunday to Monday from 9am and an hour earlier on Saturday’s at 8am. Contact can be made by submitting a support ticket online or by posting a question in the forum. There is a dedicated Support forum to get an official response which can be very quick at times but often takes 10-20 minutes to receive a reply. The community is quite active and posts in other categories will often get responses from helpful members. There are many ways to approach matched betting and the forum is a useful place for people to share ideas, good and bad. Shared experiences with real people is also a comfort at times. As mistakes are inevitably made, it’s encouraging to see you’re not the only one and that any losses are quickly recovered by other opportunities. The tutorials, product guides and general matched betting tips form a major part of the training process for new members and there are plenty of well-written articles which serve their purpose well. There is a decent selection of videos but anyone who struggles to follow written instructions will probably want to see more. The OddsMonkey.com affiliate program offers 50% commission on every Premium member referred, subject to a minimum £50 payout. The program is available to Premium members following an assessment. If you have a website, blog, social media account or youtube channel promoting sports or matched betting content, OddsMonkey will be happy to hear from you. They consider every request individually so you can make a case if your idea doesn’t fit with the majority of affiliate activity. Odds Monkey affiliates are given text links and banners to use and the affiliate software provides real-time statistics and reporting to check your traffic, sales and account balance at any time of the day. Payments are made to the PayPal account used for paying Premium subscriptions and are made on the 15th of every calendar month. OddsMonkey.com has historically been best known for its Oddsmatcher software but deserves recognition for the quality of training materials provided for its members. The software has strengths and weaknesses but few matched betting websites can make genuine claims to offer a better suite of tools. Oddsmatcher may contain too many superfluous bookmakers and would be much better with more frequent refresh rate but it certainly pays its way in finding matches quicker than doing it yourself. The racing matcher and each way matcher are good additions and will help keep the profits rolling in. The accumulator tools will also help members make money but it’s disappointing to see another leader in the matched betting field unable to work out how to find the most profitable bets to place. The training articles are easy to follow and most newcomers should have no trouble understanding what to do and why. While the site navigation is not the most intuitive, it is easy to get around with a little practice. However, the mobile experience leaves a lot to be desired. All in all, OddsMonkey.com provides a lot of features for a relatively small price at £17.99 per month or £99 per year.